Following the first ever one-on-one meeting between a US president and North Korean supreme leader, I’m not the least bit surprised to see #TheResistance sputtering with rage that we won’t be conducting joint military drills with South Korea. Really? You guys are mad about that? I liked you better when you were candlelight vigil-holding, peace-loving wussies. We need to have a talk about this sometime. But that day is not today. This day, we have peace. Or a vague promise of it. Look, when discussing potential peace for all time on the Korean Peninsula, it’s necessary that I qualify my observations that I spent all last Fall fully expecting Trump to launch strikes against North Korea. It didn’t look to me that Kim had any way out of the box he’d put himself into and Trump’s Syrian bombardment had me convinced that he was willing–and certainly justified–to blow up some North Korean guys. Then Kim called him a “dotard” and Trump called him “fat”. Wars have started over far less than that. In the end–at the moment–it turned out I was wrong. I’m happy to have been wrong. Now, in my defense, I had no way of knowing that Kim would accidentally demolish his own nuke test site or that China would be sufficiently convinced by Trump’s rhetoric and staging of three carrier battle groups that it would sufficiently help enforce sanctions on its end. That was new. For all of it, Trump and Kim have talked. 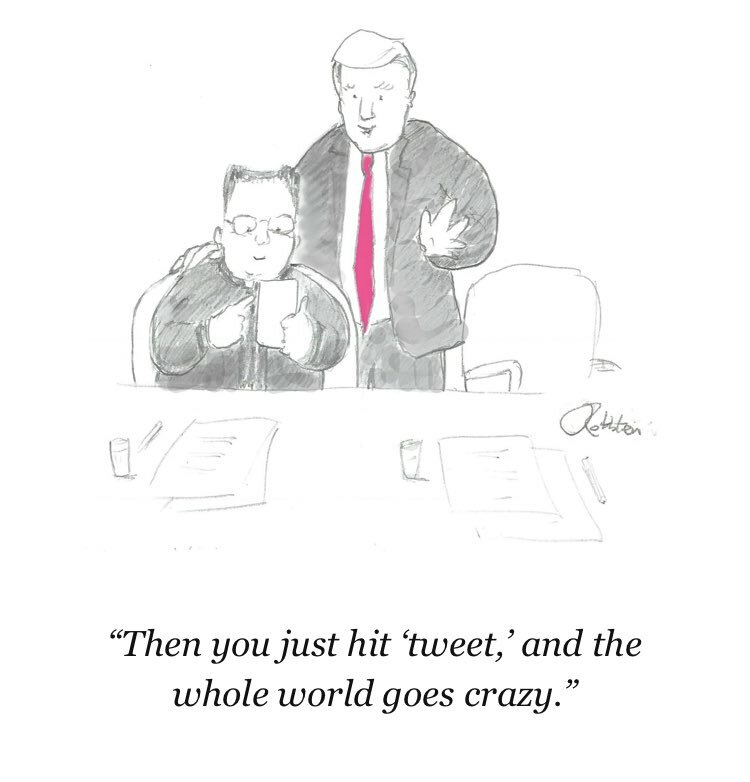 Kim stopped firing missiles and Trump stopped saying mean things about him on Twitter. Again, I’m not surprised that the political Left is beside itself. There is a contingent among them who are so deranged that seeing Honolulu vaporized would have filled them with glee to think that one of Trump’s golf courses might have been destroyed in the process. What’s more surprising to me is how many on the Right who are down on this whole arrangement. They’re not simply skeptical about it. They’re mad. Part of it is because Trump praised Kim (apparently not understanding the concept of being “diplomatic”) and some of it is because they think it’s hypocritical to praise Trump for something Obama would have been ripped for doing by holding a meeting with no preconditions with a sworn enemy (as he did in Cuba and Iran). Another part, I think, is that some of them are lunatics who seriously think it’s America’s privilege to have troops fight and die in other people’s wars and that we shouldn’t back down from any opportunity to do so, ever. They think Trump gave too much away in exchange for nothing. I understand why so many are upset about Trump calling Kim “talented” and for thinking it means that the US no longer cares about human rights. It does, but enough to derail disarmament negotiations between us and a nuclear-armed rogue state? It can go on the back burner. Is it worth having that talk later? Yup. Worth fighting about with the incineration of Disneyland on the agenda? Nope. Put it in context. Trump has been known to praise even the most depraved and despicable enemies of the American people in the name of diplomacy and putting aside past hatred. It doesn’t always work, but goodwill between leaders can make a difference in circumstances such as these. It’s hard to imagine the Cold War winding down as smoothly as it did without the deep and abiding friendship that developed between Reagan and Gorbachev, for example. Plus, Kim needs that for popular consumption at home as well as among his inner circle. By building him up and not demeaning him on the world stage, Trump gives Kim credibility for any future deal. Kim exists to protect the North Korean people, in their version of reality. If Kim is seen as strong enough that he has guaranteed the Americans will never invade by his generals, it’s the only thing that will make peace possible. Otherwise, they would just throw him out in a coup, as the Soviet commissars tried to do to Gorbachev at the end of the USSR. Additionally, Trump treating him with honor means that if Kim betrays the deal and endangers his nation, he’ll take the blame among the men with long knives around him. Does that mean Trump is being given a pass for things we would’ve berated Obama for doing in the comment section of The Blaze? Well…yeah. We have to be honest. Okay, we don’t have to be but I will anyway. I’m a recovering ODS patient. It’s something I have to balance against my interest in history, particularly with regard to the character and achievements of American presidents. Obama has a place in that and even though it’s still too soon to say what legacy he left, I want to view him fairly. Eventually, anyway. Let’s examine Obama’s outreach then. First, Iran. I think Obama’s desire to disengage from the Middle East and make Iran someone else’s problem was perfectly fine and consistent with actions that I praise Trump for doing now. I think he bungled the implementation with the craven bribery that was the Iran Deal but I will now admit that Obama was essentially correct that Iran is not a threat to us, has no need to nuclearize if we’re not threatening it, and is more than welcome to have it out with Israel, Saudi Arabia, and Turkey if that’s what they have to do. For Cuba, there was no reason to isolate them anymore once we got over our counterproductive pride about dealing with Fidel Castro. They’re in an extremely critical strategic location that we can’t ignore. We cannot ever again risk the island becoming a vassal of a hostile power from the other side of the world like in The Missiles of October, right? If there’s one thing I’ve been arguing a lot lately, it’s that we should be able to put sentimentality aside for the sake of our national interests, right? In any case, the whole thing was low risk/high reward from my point of view. If there are two things I love those are rum, tobacco, and rum. So I now declare that we should acknowledge that Obama was as wise as Trump is now by engaging with enemies so that we could better serve our own strategic needs. Obama just sucked at negotiating and Trump is better. I mean, anybody is better. Nope, I just can’t get the ODS completely out of my veins. Some have said Trump gave too much away. I strongly disagree. He gave away nothing. It was perfectly appropriate to meet with Kim since he was presenting a grave threat to us directly. Nothing has changed for me since my last post on the topic. The real problem with this has always been that Kim couldn’t agree to give up his nuclear program without assurances that the US wouldn’t invade. Trump is making the right steps toward granting that but hasn’t put us into any sort of irreversible position that weakens our ability to spank Kim hard if the need arises. The military exercises aren’t scheduled until next year, I believe, and Trump can always threaten to hold them if Kim goes wobbly on the deal. And remember that we did get back a few prisoners the Norks were holding. We didn’t even have to send pallets of cash. If you’re angry about this deal because of how you feel about Trump or Kim or both, then reassess your priorities, you nut. If the United States, with its admittedly warlike nature, can get a lunatic nation like North Korea to end its nuclear program without a shot being fired, it’s a win for humanity. It wasn’t that long ago they were calling Trump a warmongering lunatic who wanted nuclear war. So what is he now, a peace-mongering lunatic who wants Big Macs in Pyongyang? So what is he now, a peace-mongering lunatic who wants Big Macs in Pyongyang? I believe the prevailing theory is that he wants to build a Trump Hotel in Pyongyang and then he’ll force the State Department to block all travel to North Korea. When the hotel goes bankrupt, he’ll transfer all of his Russian collusion documents to it and then promptly declare war against North Korea. The hotel will be destroyed, he’ll profit from the insurance claim, and then something about racists. Why are inspections going to work in NK? How did parents of a Korean vet tell Trump they wanted their son’s remains returned? Are they vampires? Was their son not a vampire too? Confused. Ah, but Cult of Personality will get the job done…. …and destroyed a weapons test site..
How did Trump do that? Maybe when Trump became president, he gained Obama’s superpower ability to see dead people through some sort of Predecessor Replication. All gaffes aside, I heard Trump repeatedly say “families” of Korean War dead. It’s plausible that he spoke with a sibling or child of a Korean War vet, yes. A year ago, I would have been surprised by this. Now I’m unfazed. It’s just the way it is. They’re going to be crazy and the world will move on. So where the left was after a year or two of ODS then, before witnessing it for the following six or seven years and then even more after he left.